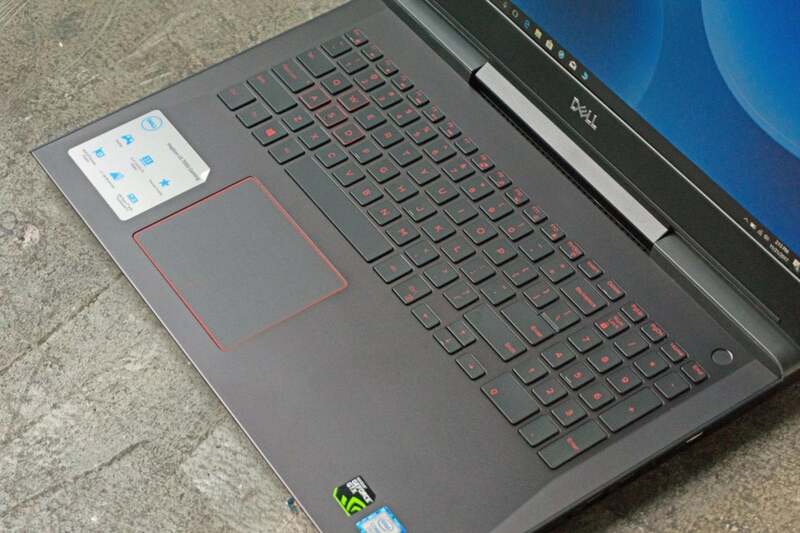 Dell’s Inspiron 15 7000 Gaming Laptop has a little secret that’s good news for budget-minded gamers. It’s hard to tell from the product information online, but one GPU option for this laptop is Nvidia’s GeForce GTX 1060 Max-Q. Max-Q GPUs manage performance closely to balance heat and noise, allowing powerful chips to go into lighter, slimmer, quieter laptops. The Inspiron 15 7000 Gaming Laptop offers Max-Q in a SKU that supports 1080p gaming and comes in just under $1,000. It’s a great value. Dell’s New Inspiron 15 7000 gets you to GeForce GTX 1060 Max-Q levels for a scant $1,000. That’s right: With the gift-giving season in full swing, we found the version we tested, with a Core i5, GeForce GTX 1060 Max-Q GPU, 8GB of DDR4/2400 RAM and 256GB SSD, for $949. Here are more details. CPU: Core i5-7300HQ. This is a 7th-generation Kaby Lake CPU with its Hyper-Threading permanently turned off. For most traditional gaming, a quad-core without Hyper-Threading suffices. Dell also offers a 7th-gen Core i7 option. RAM: 8GB of DDR4/2400. There’s just one memory module in the Inspiron, so it’s operating in single-channel mode rather than dual-channel mode. 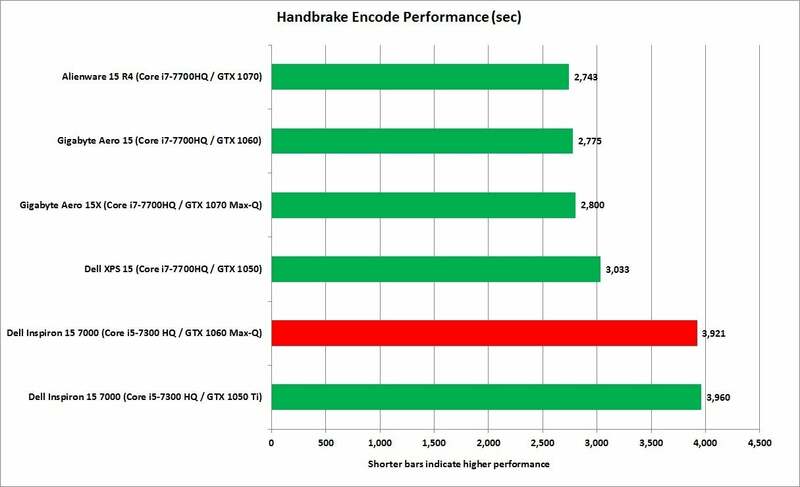 This would be more disappointing if there weren’t a discrete GPU. We’d also prefer gaming laptops to offer 16GB of RAM, but it’s an easy upgrade (more on that later). GPU: The star of the show is the GeForce GTX 1060 with Max-Q. We’re not sure why Dell isn’t making the distinction clearer between a Max-Q part and a full-on GTX 1060 GPU. Given the strong results from our test unit, it’s not the compromise we were expecting, so why not crow about it? Display: When we reviewed this laptop’s predecessor last year, we didn’t like its atrocious TN panel. Fast-forward to the present day, and the 15.6-inch display is now an IPS screen—but a decidedly mediocre one. While still better than a TN panel, our review unit’s display had a dull look to it, probably influenced by the low maximum brightness of about 230 nits. 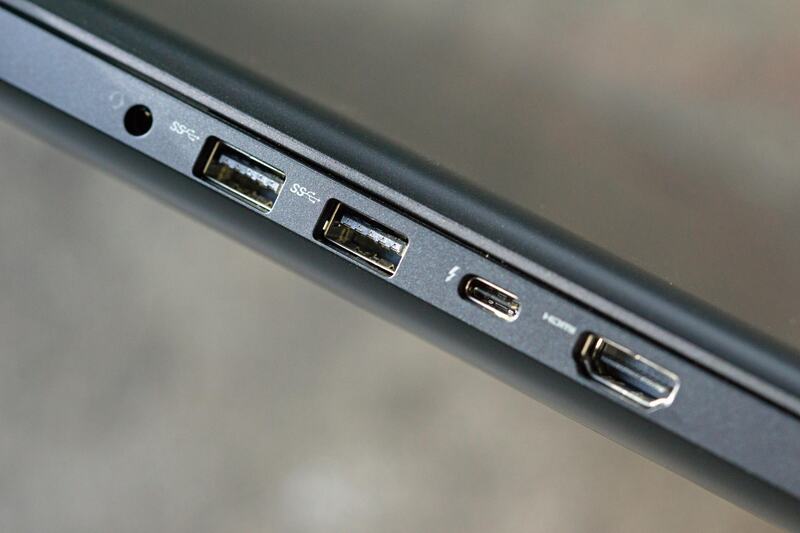 Dell doesn’t skimp on ports on the New Inspiron 15 7000. Ports: One full-size HDMI 2.0, three USB 3.1 5Gbps Type A ports, one Thunderbolt 3, one Noble lock port, Gigabit ethernet, SD reader, combo audio port. Weight: Gaming laptops aren’t known for being light, even if Max-Q helps a bit. 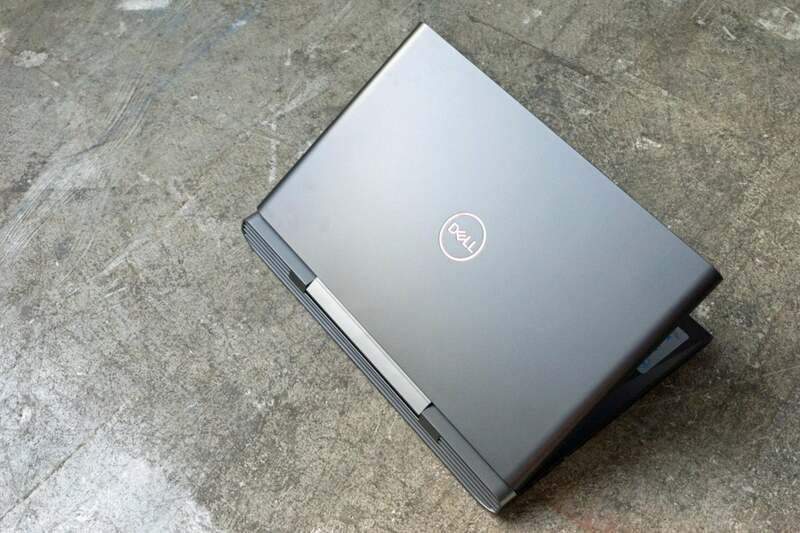 The Inspiron 15 7000 weighs a skosh over 6 pounds bare, or 7 pounds, 8.4 ounces with power brick. Dimensions: 15.3 x 10.8 x .98 inches. Keyboard and Trackpad: The keyboard and trackpad are standard-issue, functional but unexciting. They aren’t even backlit. Dell cleverly integrates a Windows Hello-compatible full fingerprint reader into the power button. The Inspiron 15 7000 Gaming Laptop stays affordable by skimping on details like RGB backlighting on the keyboard. You’ll find no such thing here. Upgrades: The vast majority of people don’t upgrade laptops, but the Inspiron 15 7000 Gaming Laptop makes the process easy if you do. A single screw opens up the insides, where you have access to two memory slots, the M.2 SSD and the hard drive bay. While some laptops don’t include the cable to connect a hard drive, Dell does so (at least on our unit). Dropping in another 8GB of RAM and a 1TB or 2TB drive is a five-minute job. One screw and you can get inside Dell Inspiron 15 7000 to easily upgrade the RAM, M.2 SSD or 2.5-inch hard drive. 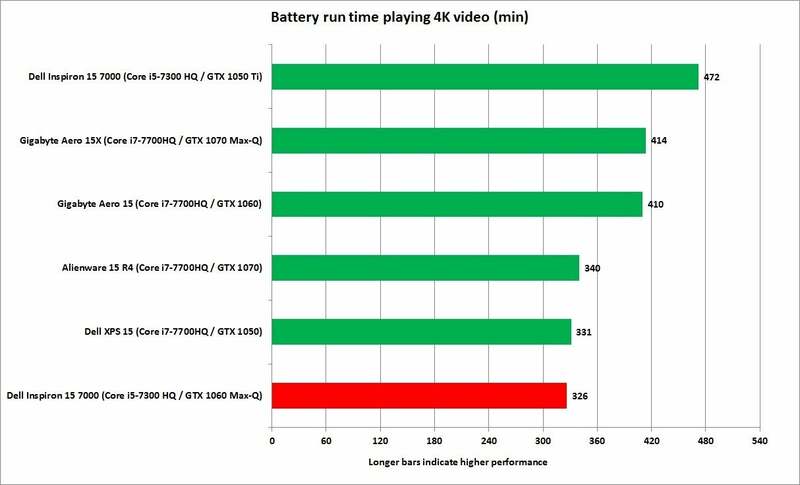 Since the introduction of Nvidia’s Max-Q technology), there have been questions about how much you give up for lower power consumption. With this machine, we’re happy to report you actually don’t give up much. 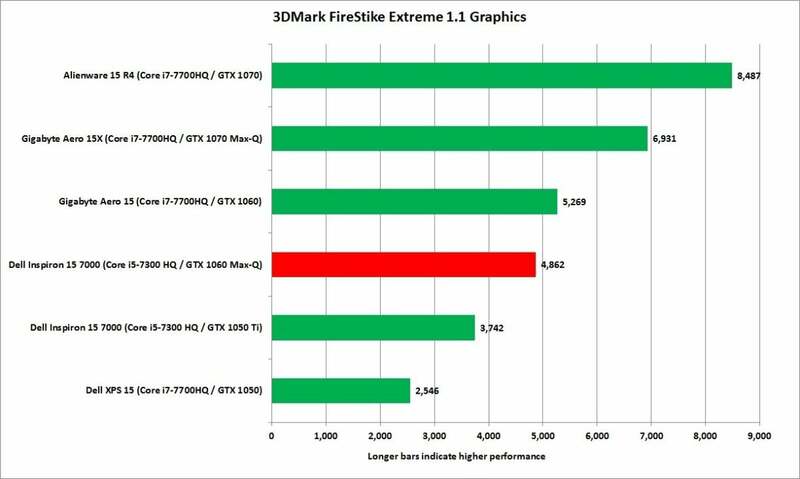 Our first test is the synthetic 3DMark FireStrike Extreme graphics test. Unlike actual games, which may lean on the CPU, this is pretty much a pure GPU test. 3DMark puts the GeForce GTX 1060 with Max-Q a few steps behind the non-Max-Q version. The important results to pay attention to in 3DMark come from the Gigabyte Aero 15 (currently about $1,876 on Amazon) which costs about $1,800 today, and the older Inspiron 15 7000 Gaming Laptop, with its GeForce GTX 1050 Ti (about $750). The current Inspiron 15 7000 Gaming Laptop keeps pace between them, but impressively close to the Gigabyte with its full-on GTX 1060. We also ran the new Inspiron 15 7000 through several real games. The first was Rise of the Tomb Raider set to Very High quality and running in DirectX 11 mode at a resolution of 1920x1080. 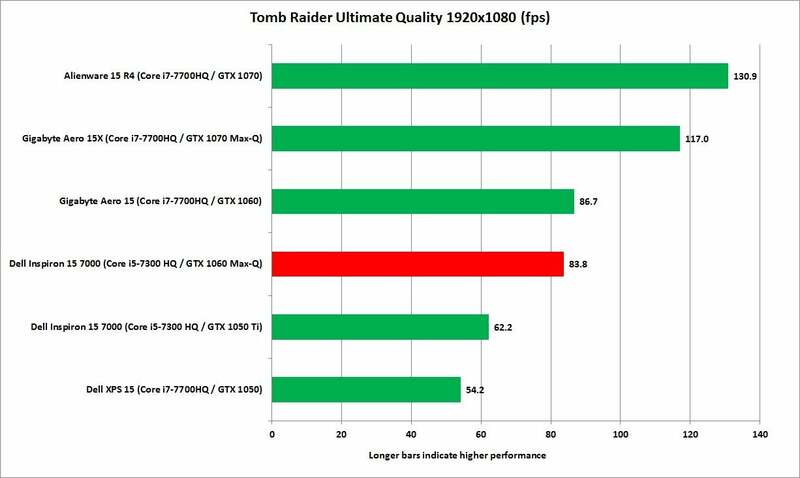 Rise of the Tomb Raider actually puts the GeForce GTX 1060 with Max-Q just a hair away from a full GTX 1060 GPU. 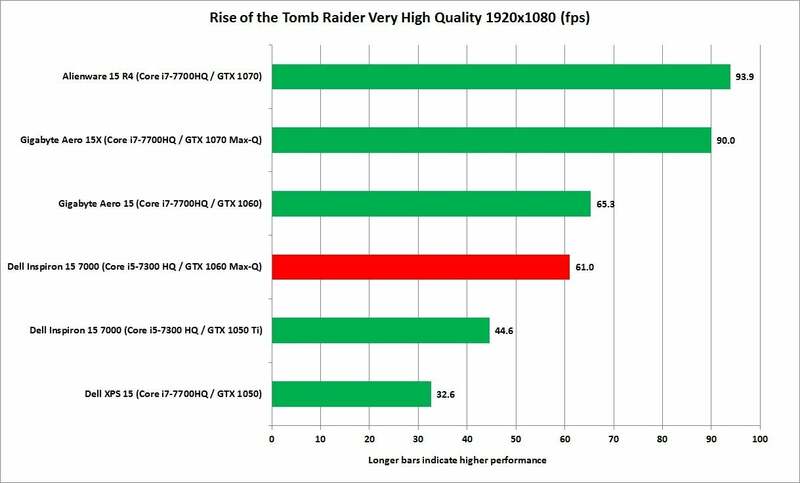 Surprisingly, Rise of the Tomb Raider places the GeForce GTX 1060 Max-Q even closer to the “real” GTX 1060 than the synthetic 3DMark test did. Even the nearly four-year-old Tomb Raider agrees, yielding the same result. Tomb Raider set to Ultimate quality as the GeForce GTX 1060 Max-Q in the Inspiron 15 7000 breathing down the neck of a full tilt GeForce GTX 1060. 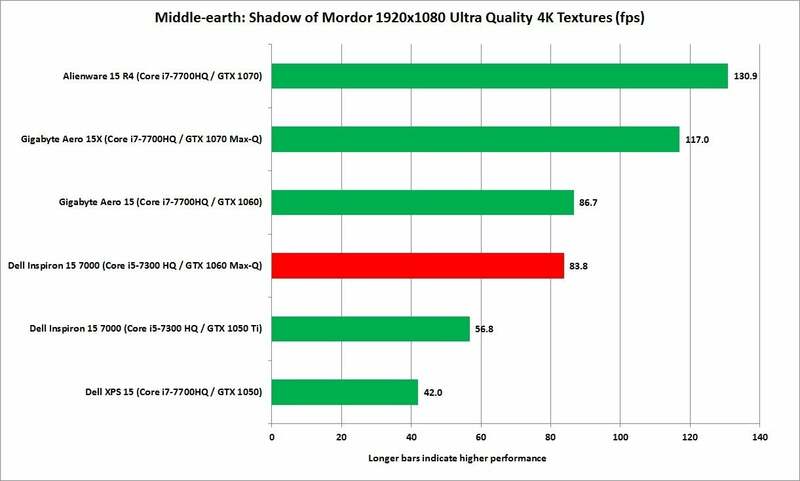 Our last gaming test, Middle-earth: Shadow of Mordor set to Ultra quality, shows little difference between the GeForce GTX 1060 Max-Q and the full GeForce GTX 1060. In hindsight, we shouldn’t be that surprised though as a standard GeForce GTX 1060 is rated at 80 watts while a GeForce GTX 1060 Max-Q is rated at 60 to 70 watts. On paper and in practice, the two GPUs are a lot closer than we thought. Still, Dell’s shyness in calling out Max-Q chip on its website, is oddly uninformative. We’d encourage Dell to be clearer on the specs. Middle-earth agrees that the Max-Q 1060 is no slouch. Paying extra for a higher-performance GPU implies gaming is a priority, but the CPU still matters. To gauge that, we use HandBrake to convert a 30GB 1080p video file using the Android Tablet preset. Video encoding is a task that leans heavily on CPU cores and threads. The main difference between the Core i5 in the Inspiron and Core i7 chips used other laptops is support for Hyper-Threading, which gives the CPU more virtual cores. How much is Hyper-Threading worth? 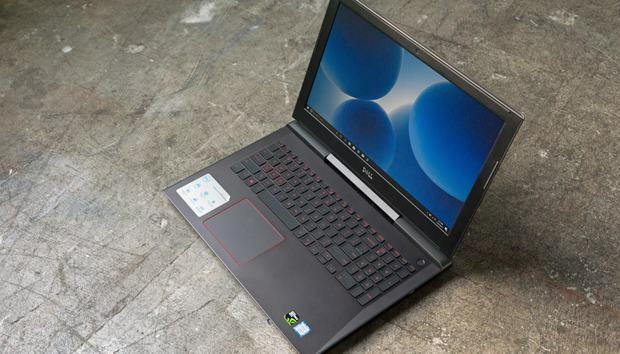 The Gigabyte Aero 15 and its Core i7-7700HQ finish our encoding test about 30 percent faster than the Inspiron 15 7000 Gaming Laptop and its Core i5-7300HQ. Still, the vast majority of games run perfectly fine on a quad-core without Hyper-Threading. You’ll give up about 30 percent of speed in multi-threaded tasks such as encoding by going with a Core i5 instead of a Core i7. The gaming difference will far less in most titles. Even if most large laptops sit on a desk 90 percent of the time, we still want to know how long the battery will last. In this case, we’re glad we checked. To measure the Inspiron 15 7000 Gaming Laptop, we played a 4K video file using Windows 10’s Movies & TV player. Normally we’d set the brightness to 250 to 260 nits, but this laptop’s screen maxes out at 230 nits. That’s a bit subpar and one of the few drawbacks in an overall nice machine. You’d expect a dimly lit display to help the laptop last longer, but we got just five hours of video playback. While that time is in line with what the Dell XPS 15 and the Alienware 15 R4 delivered, both of those laptops were run at 250-260 nits’ brightness, and the Dell XPS 15 uses a power-eating 4K touch display. The Inspiron 15 7000 Gaming Laptop is doing less with less. 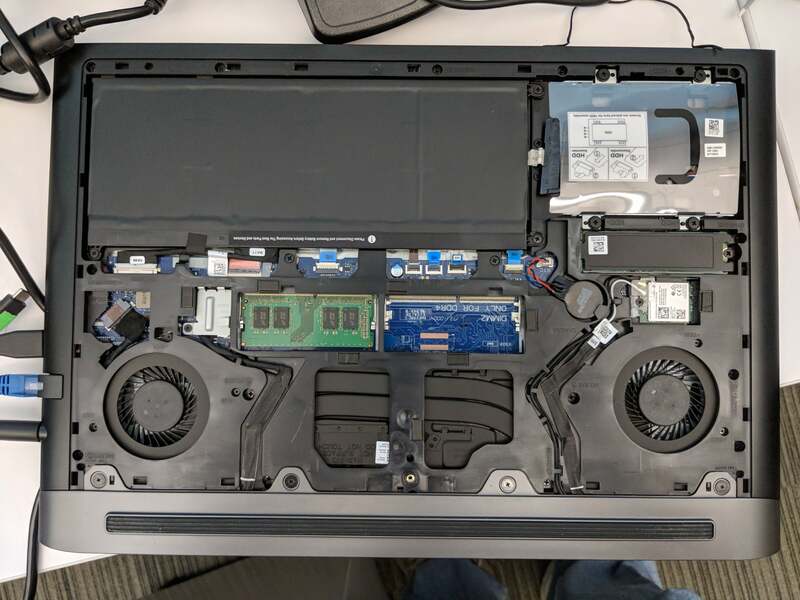 Even more puzzling is comparing the performance of the Inspiron 15 7000 that we reviewed earlier this year, which pulled down nearly 8 hours of run time. That’s pretty amazing, but it also had a dimmer screen (and TN), so we can’t explain the disparity here. Just remember to pack the power brick. The battery life is fair but laptops with larger batteries eclipse it. Does that make the new Inspiron 15 7000 a steal? Not quite, as we’ve seen a few laptops with similar parts for the same price or a little more. But the vast majority of GTX 1060 Max-Q laptops cost yet another hundred bucks or feature a hard drive instead of an SSD. Sure, it could be lighter and the screen could be brighter, but overall it’s still a hell of a bargain.